Dubai, UAE, February 08, 2018: UAE Team Emirates capped off stage three of the Dubai Tour with another hard fought performance, which culminated in Alexander Kristoff securing a top 10 finish following a bunched sprint to the line. Ahead of the race, the reigning European Champion joined team-mates; Yousif Mirza, the UAE National Champion, former U23 World Champion Sven Erik Bystrom, Anass Ait El Abdia, Filippo Ganna, Simone Consonni and Matteo Bono in meeting and signing autographs with students from Dubai College and Nord Anglia Dubai, as part of the team’s commitment to promote the health benefits of cycling and encourage the next generation of UAE cyclists to get on two-wheels. Stage three was won by Mark Cavendish (Dimension Data) who won the battle to cross the line ahead of the other sprinting riders. The peloton will make their way from SkyDive Dubai to Hatta Dam during tomorrow’s stage four, as they navigate the desert planes of Dubai, Sharjah and Ras Al Khaimah. Riders will tackle short climbs in the final third of the race and tired legs could show should those with stamina look to form a late breakaway as the riders finish at the picturesque Hatta Dam. 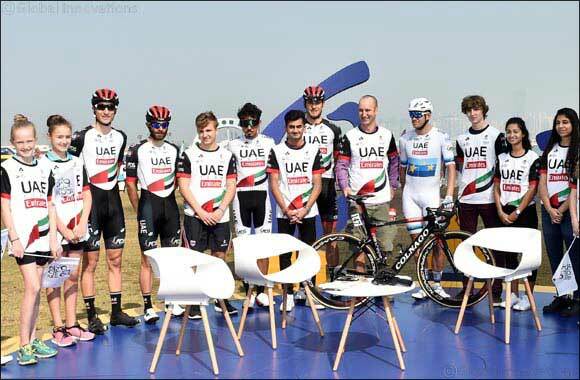 UAE Team Emirates’ participation at the Dubai Tour and the forthcoming Abu Dhabi Tour also gives the region’s community the opportunity to come together and support world-class athletes as they aim to become one of the top cycling teams on the tour.